The famous Advent hymn “O come, O come, Emmanuel,” has a rich history in the Latin liturgy and in multiple English paraphrases. The root of the text is in a series of chants known as the Great Antiphons (or the O Antiphons), with each chant containing a different name for Christ: Sapientia (Wisdom, Prov. 8:22ff. ), Adonai (Lord, Ex. 20:1ff. ), Radix Jesse (Root of Jesse, Is. 11:1), Clavis David (Key of David, Rev. 3:7), Oriens (Dayspring, Lk. 1:78), Rex Gentium (King of Nations, Hag. 2:7), and Emmanuel (God with Us, Is. 7:14). These seven chants are intended to be sung in anticipation of Christ’s birth on the seven evenings preceding Christmas Eve. The seven Great Antiphons probably date from the 8th century. The oldest known manuscript to contain this complete series of Latin texts is the Liber Responsalis of St. Gregory, contained within the Antiphonaire dit de Compiègne held at the Bibliothèque Nationale de France, MS Latin 17436 (9th century | online | Fig. 1), without music (neumes). The antiphons appear on folio 36 in the traditional order, plus two additional antiphons, “O virgo virginum” (O virgin of virgins) and “Orietur sicut sol Salvator mundi” (The Savior of the world will rise like the sun). The section is headed “Antiphonae majores in Evangelio” (The Great Antiphons on the Gospel). Fig. 1. Bibliothèque Nationale de France, MS Latin 17436 (9th century), fol. 36. For a transcription of the Latin text from MS Latin 17436, see J.P. Migne, Patrologiæ Cursus Completus, Series Latina, vol. 78, pp. 732-733 (HathiTrust). Notice in this list the addition of several antiphons outside of the usual seven: O Hierusalem, O Virgo virginum, O Rex Pacifice, and O mundi Domina. Burgert argued that Cynewulf must have had access to a manuscript with these eleven antiphons, and as an example, he pointed to the existence of this whole series in a manuscript known as the Antiphonary of Hartker of the late 10th century (ca. 990-1000), which is held at the Stiftsbibliothek, St. Gallen, Switzerland, Codex 390 (website), especially pp. 40-41 (Fig. 2). Fig. 2. St. Gallen Codex 390 (ca. 990-1000 A.D.), pp. 40-41. This manuscript includes a series of twelve antiphons, including the eleven alluded to in Cynewulf, plus “O Gabriel.” The first seven are the traditional Great Antiphons, the rest following after. Above the text is an early system of unlined chant notation, intended only to convey the melodic shape, the exact form of which would have been learned aurally. For a full a transcription of the Old English text of Cynewulf’s Christ I and a translation by Benjamin Thorpe, see Codex Exoniensis (London: Society of Antiquaries, 1842 | Archive.org), or for another English translation, see Charles Huntington Whitman, The Christ of Cynewulf (Boston: Ginn & Company, 1900 | Google Books). In the period known as the Counter-Reformation, mid-to-late 16th century, many aspects of the Latin liturgy were revised and standardized under Pope Pius V, leading to a longstanding universal practice sometimes known as the Tridentine rite. This included the elimination of any variants beyond the first seven Great Antiphons. Some observers have noted that in these seven texts, the initial letter of each name for Christ spells S-A-R-C-O-R-E, which in reverse reads ero cras (I will be tomorrow) a clever acrostic device with a particular meaning leading up Christmas Eve that gets lost in English translation. Scholars have debated wether this acrostic device was intentional or incidental. The argument in favor of intent includes the common practice of medieval writers to embed acrostic devices in poetic writing. Cynewulf, for example, is known for ending his poems with an acrostic on the letters in his name. The argument against points to the different numbers of antiphons included in the series (the manuscripts shown in Figs. 1-2 include 8 to 12 antiphons), and sometimes a different order to the series, or the problem, as Burgert put it, “no ecclesiastical writer of that age [the early Middle Ages] is known to have pointed out the acrostic in question” (p. 63). The official Roman version of the Great Antiphons from the Tridentine rite (1570–1962) is shown below as in Liber Usualis (Fig. 3). This service book indicates that these antiphons should be followed by the Magnificat. Each chant tune follows the same general melodic formula, though none are identical. Each also ends with the formula e-u-o-u-a-e (shorthand for seculorum amen). Fig. 3. Liber Usualis (NY: Desclee, 1961). The Great Antiphons were adapted into a rhyming version and published in the Psalteriolum Cantionum Catholicarum (Cologne, 1710 | Fig. 4) in five stanzas. This poetic interpretation omitted two of the series, Sapientia and Rex Gentium, thus neglecting the acrostic device and the series as a whole, but it added the refrain, “Gaude, gaude, Emmanuel, est natus pro te, Israel.” Note also that this rhyming version flipped the order of the antiphons and began with Emmanuel, a practice that would be imitated later in English translations. Fig. 4. Psalteriolum Cantionum Catholicarum (Cologne, 1710). Fig. 5. 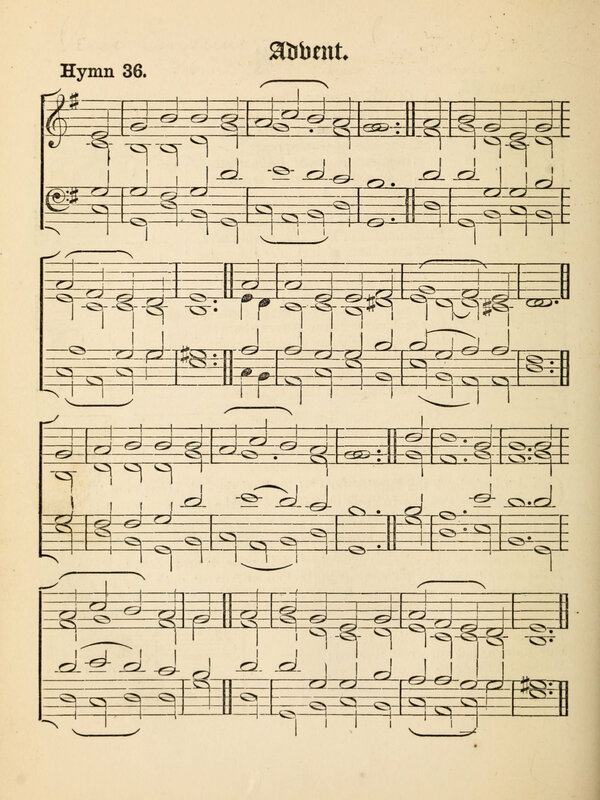 Joseph Mohr, Cantiones Sacrae (NY: Frederick Pustet, 1878). Fig. 6. Hymnal Noted, Parts I & II (London: Novello, 1856). The chant melodies in the above example, supplied by the music editor, Thomas Helmore (1811–1890), were drawn from an antiphonary in use at Salisbury. For this, he would have consulted the Antphonale ad usum ecclesiae Sarum (London, 1519 | Fig. 7), or one like it; very few survive. In the example shown below, the series of antiphons includes nine, the extra two being O virgo virginum, such as what appeared in the Hymnal Noted, and the lesser-known O Thoma didime (“O apostle Thomas”). Their presence in this service book pre-dates the establishment of the Church of England and the Catholic reforms of Pope Pius V. The Latin melodies correspond closely to the versions presented in the Hymnal Noted but vary as the syllabic requirements for the English translation are not exactly the same. Fig. 7. Antphonale ad usum ecclesiae Sarum (London, 1519), fols. 45v-47r. John Mason Neale created two different versions of these antiphons in English. The first is a set of seven hymns, each based on one of the antiphons, and each elaborating on the theme expressed by the antiphon. These were included in the third series of his Hymns for Children (1846 | 3rd ed. shown in Fig. 8). Each hymn is a prayer ending with an expression of anticipation appropriate for the nearness of Christmas, and a doxology where the second person in the Trinity is expressed by the name given in the antiphon. Fig. 8. John Mason Neale, Hymns for Children, Third Series, 3rd ed. (London: Joseph Masters, 1867). Fig. 9. Mediaeval Hymns and Sequences (London: Joseph Masters, 1851). Fig. 10. Hymnal Noted, Parts I & II (London: Novello, 1856). Helmore, in all fairness, was probably not the one who provided this tune for the Hymnal Noted. 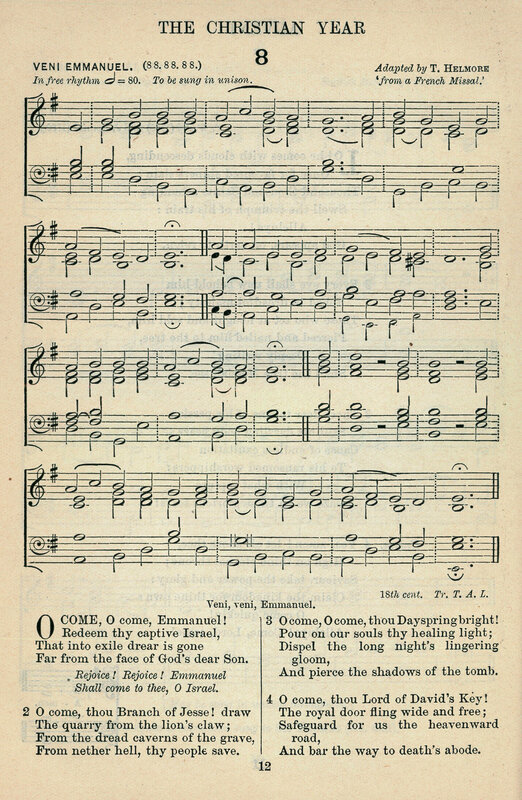 An unsigned article on plainsong in Stainer & Barrett’s Dictionary of Musical Terms (1881), attributed to Helmore by other sources, said the tune was “copied by the late J.M. Neale.” Neale had indeed visited Lisbon. In 1853, Neale was commissioned to write a travel guide, later published as A Handbook for Travellers in Portugal (1855). Among the libraries he visited during his trips in 1853 and 1854 was the Bibliotheca Publica (Nacional) at Lisbon: “It is difficult to estimate the precise number of volumes, since so many duplicates, from the libraries of suppressed convents, are now in course of distribution and exchange. . . . The library is not well arranged, is very dark, and does not possess a general catalogue. Some of the most valuable books lie in heaps without any attempt at order” (p. 14). One of his companions during a May 1853 visit was Canon (later Bishop) H.L. Jenner, who assisted with Part II of the Hymnal Noted. His son later claimed that Jenner was the one who had transcribed the melody at Lisbon. Fig. 11. Hymns Ancient & Modern (London: Novello, 1861). Some other translations have entered into common use, either independently or in mixed combination with Neale’s work. Departing from Hymns Ancient & Modern, probably for reasons of copyright and permission, the editors of The English Hymnal (1906 | Fig. 12) used a new translation by Thomas Alexander Lacey (1853-1931), who at the time was chaplain of the London Diocese Penitentiary at Highgate. 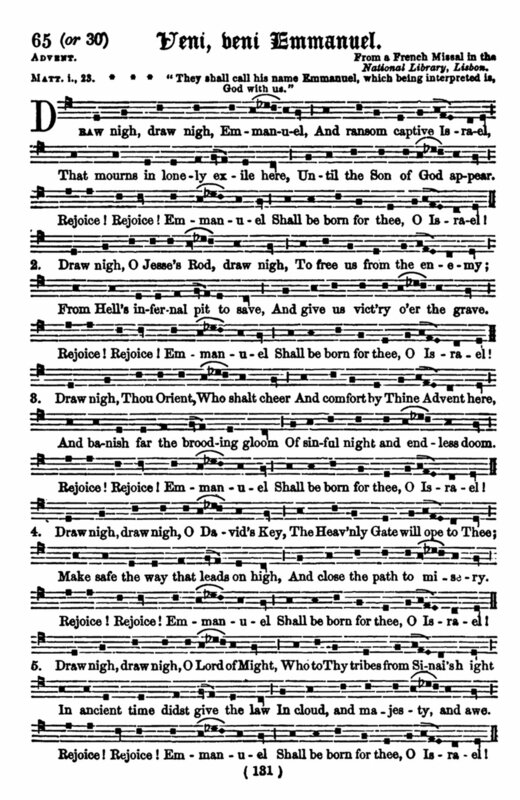 Lacey’s version used the same five antiphons as Neale, in accordance with the original Latin poem. Lacey’s text was later expanded to seven stanzas in The New English Hymnal (1986). The harmonization by Ralph Vaughan Williams (1872–1958) has a denser texture than what was given in Hymns Ancient & Modern. Fig. 12. The English Hymnal (Oxford: University Press, 1906). Another translation in common use is by Henry Sloan Coffin (1877–1954), as in Hymns of the Kingdom of God (New York: A.S. Barnes & Co., 1923 | Fig. 13). Coffin’s version only has four stanzas, but it is different from Neale and Lacey in that it incorporates the Sapientia and Rex Gentium antiphons. When he wrote this, Coffin was pastor of the Madison Avenue Presbyterian Church in New York City, then later became president of Union Theological Seminary. Fig. 13. Hymns of the Kingdom of God (New York: A.S. Barnes & Co., 1923). 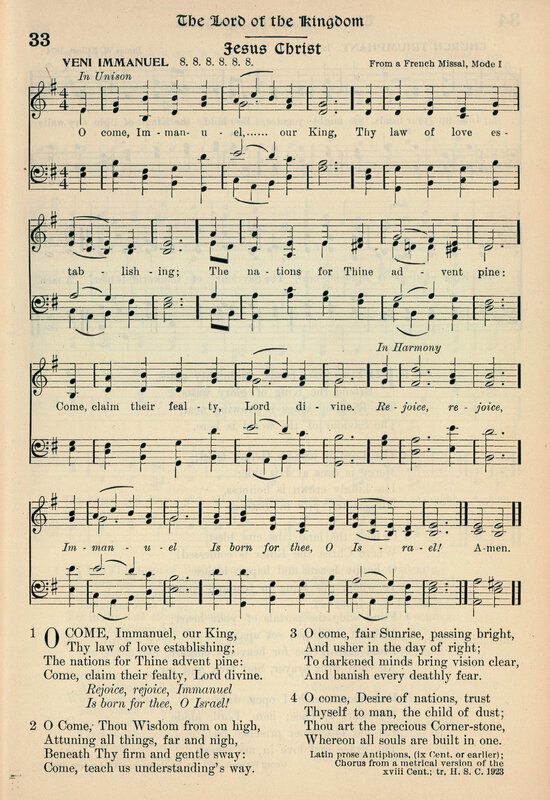 Finally, the first complete, hymnic, seven-stanza translation by a single author is “O come, thou Wisdom” by Ronald A. Knox (1888–1957) for The Westminster Hymnal (London, 1939 | Fig. 14). Knox was a member of the editorial committee for the hymnal and had been a chaplain at Oxford University until his retirement in 1938. Knox’s version follows the traditional sequence of the Great Antiphons. Fig. 14. The Westminster Hymnal (London: Burns, Oates & Washbourne, 1939). “O come, O come, Emmanuel,” Hymns Ancient & Modern Historical Edition (London, 1909), p. 59. Robert Guy McCutchan, “O come, O come, Immanuel,” Our Hymnody: A Manual of the Methodist Hymnal (Chicago: The Methodist Book Concern, 1937), pp. 115-116. Bernarr Rainbow, “Thomas Helmore—II. The mystery of Veni Emmanuel,” The Musical Times, vol. 100, no. 1401 (Nov. 1959), pp. 621-622. Mother Thomas More, “O come, O come, Emmanuel,” The Musical Times, vol. 107, no. 1483 (Sept. 1966), p. 772. Frank Colquhoun, “O come, O come, Emmanuel,” Hymns That Live (Downers Grove, IL: InterVarsity Press, 1980), pp. 17-24. “Veni, veni, Emmanuel,” New Oxford Book of Carols, ed. Hugh Keyte & Andrew Parrott (Oxford: University Press, 1992), p. 45. Joe Herl & Manuel Erviti, “O come, O come, Emmanuel,” The Hymnal 1982 Companion, vol. 3A (NY: Church Hymnal Corp., 1994), no. 56. J.R. Watson, “O come, O come, Emmanuel,” An Annotated Anthology of Hymns (Oxford: University Press, 2002), pp. 34-35. Paul Westermeyer, “O come, O come, Emmanuel,” Hymnal Companion to Evangelical Lutheran Worship (Minneapolis: Augsburg Fortress, 2010), pp. 24-26.